Hello and welcome to my Yokohama Tornante review. In a search for more buyers, tire manufacturers often make a combination of things in a tire that was previously not thought of. For example, the Yokohama Tornante is a tire that’s rated as all-season performance, but one that should offer a comfortable driving experience as well. The Japanese company is no stranger to pushing the boundaries when it comes to new tire categories, and I am glad that they made a combination of two of those things. The Tornante has a lot going for it. First of all, the price is very tempting – it’s lower than all-season competitors from Michelin, Bridgestone, and Continental. Then, despite the lower price, Yokohama says that this tire provides better handling ability than a normal all-season tire, extremely long tread life, and a comfortable driving experience akin to a touring tire. This may sound like much, and it certainly is, but in the case of Yokohama I am always carefully optimistic – all of their tires I’ve tested so far have been up there with the best tires in their respective classes, and that’s even true for mishmash tires like this one. Scrolling through all the features the Tornante has, one thing immediately catches my attention – the 85,000-mile treadwear warranty. This didn’t catch my attention only because it’s very long – better than some premium competitors, but because it can have a negative effect on performance, especially handling precision and responsiveness. That said, it’s certainly tempting for every tire buyer – the ability to use the tires several years in a row is something nobody would say no to. And it’s not just the number – Yokohama made this tire of advanced high-performance compound and designed it with 3D Adaptive Sipes, both of which help for longer-lasting tread life. Let’s get back to the features. For a quieter ride, Yokohama used their Multi-pitch Variation technology. It’s something like a noise canceling for your tire that reduces amplification of pattern noise and makes driving much quieter. The asymmetrical tread design with wider blocks on the outside tread provides exceptional dry performance, while the increased groove area inside helps with better traction in rain and snow. Hydroplaning is kept in check with the four deep circumferential grooves and sweeping cross grooves. Interestingly, the Tornante does have some high-performance features for more spirited driving, such as constant contact ribs for increased rubber-to-road contact, and cross-supporting tread blocks that work together as one for excellent grip in the fast corners. One of the most unexpected features is the low-rolling resistance. Yokohama equipped the Tornante with an advanced compound that will help you save fuel at the pump, and also lower the emissions of your vehicle. Neat. 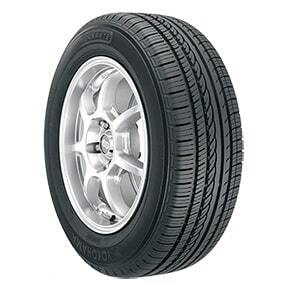 The Yokohama Tornante is available in sizes ranging from 15”-18”. It’s applicable to subcompact and compact vehicles, as well as midsize and executive sedans. This is the part where we will put the 85,000-mile treadwear warranty to the test. The Yokohama Tornante is a very durable tire indeed – it will certainly last you for several years, especially if you rotate the front and rear tires on every oil change. The tread will be almost intact after 20,000-30,000 miles, or in other words, it will have almost the same performance it had when it was new. But, what if you compare it to touring tires? Well, the best touring tires out there will have even longer tread life. Even though the Tornante is better than performance tire in this regard, it’s far from the best touring tires. Aggressive driving can make an even bigger difference in durability, so keep that in mind before shelling out the cash. What the Tornante lacks in durability when compared to touring tires, it certainly adds in the performance category. Handling is not at the level of real performance tires, but if you’re not overly aggressive, the Tornante will provide you with responsive handling and high levels of grip. If you want to occasionally have fun on a twisty road, this tire can provide you with enough grip in the corners – certainly more than a touring tire will have. This also has implications in the safety category – the Tornante feels better than a touring tire behind the steering wheel and your car will feel more controllable. Stopping distances are also short – nothing to complain about there. The same things I said about dry weather traction are applicable to wet weather as well. The Yokohama Tornante resists hydroplaning very well and is very controllable on wet surfaces, but it’s not at the level of high-performance summer or all-season tires. That said, when compared to the best touring tires it is very competitive. In the end, the casual driver will certainly have nothing to complain about – the car will be easily controllable and safe in the wet. Yokohama markets this tire as an all-season one, but in my testing snow performance is below-par. Sure, it can somehow drive over light snow, but I would strongly recommend a proper winter tire. The Tornante quickly loses grip in the snow and stopping distances are also longer than I anticipated. Performance in dry and cold conditions is also worsened, and there is almost no grip on ice. This is no coincidence – the Tornante is not made with Orange Oil like higher-end Yokohama tires, which keeps the tire pliable in colder temperatures. Yokohama really tried to improve quietness on the Tornante with several design decisions, but a proper touring tire is still a much quieter prospect. The Tornante is not loud – far from it, but if you want maximum silence on your next road trip, this is not the tire for you. Almost the same can be said about comfort – the ride is not harsh, but it’s not sublimely smooth either. So, is this tire as good as Yokohama tells us it is? I will say that you must set your expectations right. For the price, you really get a tire with very good handling ability in dry and wet weather, and one that is very durable, almost at the level of a proper touring tire. However, don’t expect sporty grip in the corners, and certainly, don’t expect the highest levels of comfort. If you want a combination of all those things, a set of Yokohama Tornante may be a very good prospect for you. Just don’t forget to put them in the garage in the winter and refresh your vehicle with proper winter tires. Thanks for reading and I hope you found this Yokohama Tornante review helpful. If you have any questions or comments please feel free to leave them in the comments section below.